The 2017 Women &Technology Conference featured a wide variety of keynote speakers and panelists, special guests and a communications workshop. Held June 26 at the Embassy Suites in Charleston, the event attracted more than 125 people interested in encouraging more women to pursue STEM careers. U.S. Senator Shelley Moore Capito greeted participants and stressed not only the importance of STEM education, but also the critical role of career and technical education, especially in terms of advanced manufacturing jobs. Dr. Maura McLaughlin, Professor in the WVU Department of Physics & Astronomy and Director of WVU’s Center for Gravitational Waves and Cosmology, delivered the opening keynote address. 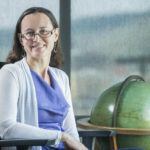 Her work with the Pulsar Search Collaboratory, a joint project between the Green Bank Observatory and WVU, encourages high school students to pursue careers in STEM. In discussing both her research and the route she followed to pursue a career in science, Dr. McLaughlin noted that an exciting hands-on experience using a large telescope to conduct research in college contributed to her decision. 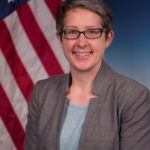 Charleston native Dr. Anne Fischer, a Defense Science Office program manager for the Defense Advanced Research Projects Agency (DARPA), spoke at the conference luncheon, which was combined with the Charleston Area Alliance Elevations Network luncheon. DARPA makes pivotal early investments in new technologies for the military and national security. Many of the technologies developed by DARPA have widespread commercial application as well, including the Internet, advanced prosthetics, and GPS, to name a few. Dr. Fischer discussed research underway on novel polymers for therapeutic and diagnostics, molecular informatics, and new ways of synthesizing small molecules using data analytics. She noted that her fascination with science started with molecules while she was a student at George Washington High School. The idea of tackling a big challenge before being completely confident also arose in the panel discussion, “Creating a Tech Revolution in West Virginia.” Presenter Megan Bullock, Co-Founder and Brand Strategist of MESH Design & Development, cited studies that show women won’t apply for a job unless they believe they are 110 percent qualified, while men will likely apply if they believe they’re 60 percent qualified. Lee Farabaugh, Co-Founder & Chief Operating Officer of Core10, stressed the unique role that women can bring to tech firms, with a strong appreciation for empathy and a wide capacity for creativity. 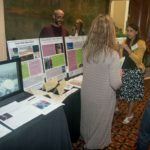 Natalie Roper, Executive Director of Generation West Virginia, observed that young people are attracted to areas and opportunities where they believe they can have an impact and make a difference. A group of young millennial women working in STEM fields shared their thoughts and observations in a panel discussion moderated by Dr. Michelle Foster, President & CEO of the Greater Kanawha Valley Foundation. Topics included, but weren’t limited to, subtle distinctions between how women and men are treated in the workplace; the need to always work harder to prove yourself as a woman; the value of mentors and role models; the benefits of being pro-active on salary negotiation; and the important role of family-friendly workplace policies for flexible schedules, family leave, equal pay and more. Thanks to our young millennials for joining this panel: Brooke Albin of MATRIC, Emily Rawlings of TransCanada Corporation, Sabrina Ridenour of General Motors (2017 graduate of the WVU Statler College of Engineering & Mineral Resources) and Shanna Sanders, 4th year University of Charleston School of Pharmacy student. April Kaull and Candace Nelson, both with WVU University Relations, led a communications workshop that highlighted the importance of telling tech stories and offered practical tips for success. Who knew that the best time to post on Facebook is 1pm-4pm on Thursdays and Fridays? They also shared information about numerous resources—most of them free—to create more powerful stories, including Pexels, Unspalsh, Canva, Befunky, Easel.ly and Infogr.am. 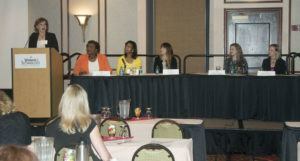 To see more photos of the conference, visit the WV Women & Technology Facebook page. Visit, like, share photos from the conference and tag!